Putting together the suspension was one of my favorite parts besides the engine and stereo. I originally purchased a set of 18″ Bonspeed Deltas as soon as I got the car, but one day I went to the Del Mar Goodguys car show and fell in love with the Budnik Shotguns. The Bonspeeds have been used on a number of cars in magazines recently since I purchased them so I was bummed because I really wanted a fairly unique set of rims. Since I never ended up using the Bonspeeds (and Nitto tires that came on them), and due to inflation, I was actually able to sell them on eBay for as much as I paid for them. When I received the Budniks, I was exceptionally happy with them, and realized, I made the right choice to switch. Also, I went with a 19″ rims in the back which filled out the rear tires well better. I had the rear wheels custom made to a 9.25″ width for a perfect fit without having to touch my sheet metal, and I also had some custom brushwork done on the accents. That custom work ran up the price a bit. 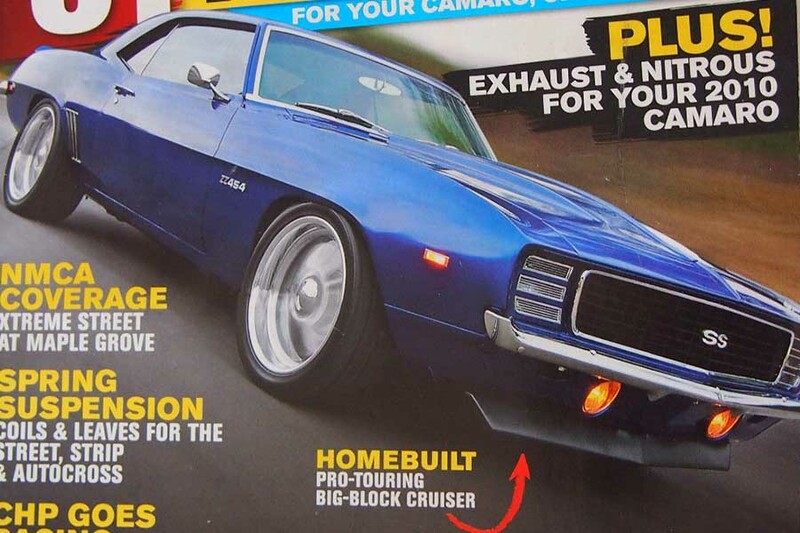 In my humble opinion, 20″ rims look too big on a ’69, whereas the 19″ is just right. A ’67 or ‘68 Camaro has a higher wheel arch and 20″ rims look good on them but look a little toy-ish on a ’69. Of course, the 19″ size severely limits my options for tires. The idea behind the drivetrain (excluding the engine) was to build it very solid. Something that would stand up reliably to big block torque and would also be comfortable on the highway. After doing research on both the 700 R4 and 200 4R 4-speed automatic transmissions, I decided to go with the 200 4R because the gear ratios were slightly better. Despite what some people say, a built 200 R4 can be just as strong as a 700 R4, so I bought the best and strongest 200 4R on the market from Bowtie Overdrives. I coupled that with a very strong torque converter, driveshaft, and 1350 series u-joints. I then bought the best rear differential I could find – a 12-bolt Moser. Of course, Ford 9″ rears are great too, but I wanted to stick with GM parts. I went with 3.42 gears because it couples up nicely with the gear ratios on the 200 4R. I don’t have a lot of tires and the ZZ454 will be dumping a lot of low-end torque on those tires off the line, so I don’t see how a set of 3.55’s or higher in the rear is going to get me anything usable, however, the 3.42’s will give me a great final gear ratio for top end and highway driving due to the overdrive. Of course, a 5 or 6-speed manual would give me even better ratios to work with, but I’m happier with an automatic due to the more consistent launches. NOS Big Block engine mounts shifted Engine 1 inch forward. So I had to buy a new one from Inland Empire. At the same time, I realized it would be best to use 1350 series u-joints, so I also had to switch the yoke on the new Moser I just ordered.